Since my success at the Nong Khai Half Marathon in late December, I’ve been working away in the background to help the old body get over its injuries whilst maintaining a decent level of fitness. The soaring heat, traffic, pollution as well as the many distractions here in Thailand can make it difficult to maintain your focus. That said, for me, training is a way of life. Getting up and going for a run or cycle is as natural as brushing my teeth. It’s just what I do. Although there can be sacrifices along the way, I’m sure that the benefits outweigh them by tenfold and more. This week I missed the joys of watching the Scotland v England Rugby Game in a local bar as I chose to have a quiet night in preparation for my first race of 2018, the 1st Rimtai Minimarathon. I had watched the Kilmarnock v Hibs football game unfold through social media and was enthused but not entirely surprised when Steve Clarke’s side came back from losing two early goals to draw level and be denied victory by a couple of outstanding saves by the Hibernian goalkeeper. To be honest, I wasn’t sure if I would run the race and decided not to set my alarm but to let nature take its course. As it happened, I woke up at 4 am which was perfect timing for a pre-run porridge breakfast and then went back to sleep, wakening up again at 5 am. Fate was dealing me a good hand and it didn’t take me long to get ready and I was soon on my motorbike and heading north along the unusually quiet Chang Phuak (Albino Elephant) Road towards Mae Rim and the race HQ. There had been a bit of confusion around the race start time with me being quoted 6 pm, 6 am and 6:30 am. I ruled out the first one and arrived around 5:45 am in time to collect my Bib number and hand in my personal belongings. Just to set out the scene, the race was organised by the local Rimtai primary school which is on the main road through Mae Rim. As I made my way to the race, I noticed volunteers placing traffic cones along the side of the road, in the lane usually preserved for motorbikes and bicycles, the road was quiet but I’m still not sure how safe it was as I know just how busy that road can get. In the school itself, there were hundreds of pupils all sitting in lanes in front of the main stage, which various tables were laid out for registration, bag deposit and an assortment of various food and drinks both hot and cold. It still being before sunrise it was dark and a number of runners ran around the school doing their pre-race warm-up routines. Which I initially thought was a bit premature for a 6:30 am race. 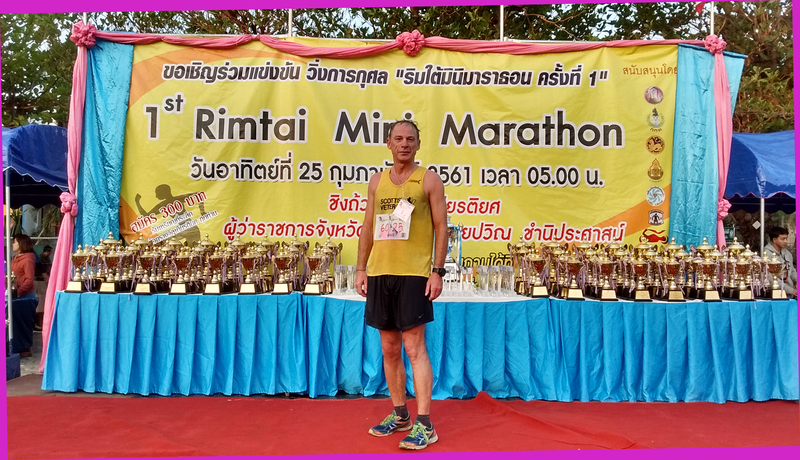 There was also a bit of confusion for me at least on the race distance as it had been advertised as a ‘mini marathon’ which seems to cover quite a large spectrum of possibilities in Thailand. Oh, and I was the only ‘farang’ among the hundreds of people at the event. I was going through my warm-up and someone pointed out that the race was about to start and I quickly made my way across the field. I had noticed at registration that there were a lot of runners in the MV60 category and knew that I wouldn’t be able to rest on my laurels if I was to have any success today, so rather than joining in at the back, I joined in at the front of the assembled masses finding a wee space in a corner amongst the local club runners. After a number of speeches and a ceremonial cutting of the start ribbon, we counted down from ten before dashing off into the great unknown at 6:13 am. Well, not exactly the great unknown but the main road where we turned left, heading north along the 107. My lack of warm-up was evident as I felt sluggish, especially among the youngsters who tend to sprint off right from the ‘go’. As usual, the race took a little bit of time before settling down and I noticed one of the best local female runners, Jit Pd ahead of me. After 1.4k, we turned off of the main road and onto the tourist road, route 1096, which leads to various attractions including tigers, monkeys, elephants, snakes and insects as it makes its way uphill and into the mountains. I was just mentally preparing myself for the climb when we turned another left and ran along a very dark road with the river on our right-hand side. Despite the lack of light, it felt good to be out running in the countryside. Jit took on some water at the first drinks station but I didn’t bother and found myself overtaking her. However, it didn’t take her long to catch e up and start to build a gap between the two of us. At this point, another woman runner caught up with me and we exchanged pleasantries before I asked her how far today’s race was. I know, I know. She advised me that it was 10.4k which at least gave me some idea as to what the actual length would be. A quick look at my watch revealed that I had already had three miles under my belt and was around the halfway point. I increased my pace leaving her behind and closing the gap on Jit who was now running in a small group which included a diminutive runner with grey hair. The race felt good at this point, I was running at a decent but comfortable pace, I had my own pacer, a potential age category rival and I even had an idea of how far there was to go. I could have been quite happy running the race at this pace but I knew that I could run faster, so I dropped down a gear and quietly reached the group containing Jit. A quick glance at the diminutive runner’s Bib confirmed that he was indeed in the MV60 category. I had hoped that I would be able to overtake them unnoticed and keep my find focussed on the race but it was not to be as one of the runners shouted out “Wow! You run very well!” and the whole group looked round to see me. The young athlete then chased after me taking the opportunity to practice his English. Not wanting to appear rude, I chatted with him for a few minutes which allowed Jit to overtake the two of us on the inside. I took up the shackles again, left my new running buddy behind and ran past Jit. With no further distractions, I started to build up a lead as we returned to the main (107) road. I knew that the route was now straight along the coned off lane for around 3k to the finish line at the school. Spurred on with the knowledge that there was at least one other MV60 chasing after me, I set my mind on holding off any challenge and catching as many other runners along the road. The route became congested as I caught up with hundreds of school kids whose ‘fun run’ also took in the final kilometre or so of the course. I was happy working hard along the final strait knowing that there wasn’t too long to go. 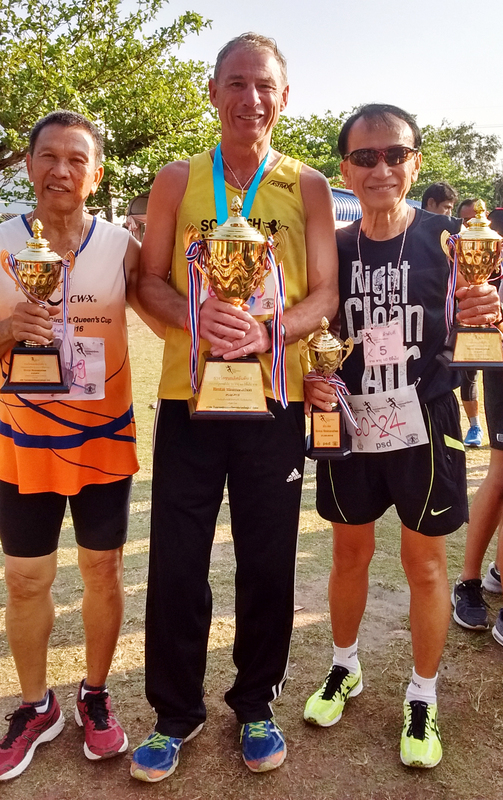 The sight of a couple of traffic police waving their torches was the trigger to run faster, as soon as I turned left and sprinted towards the finish line with cries of ‘hok sip’ (60) ringing in my ears. 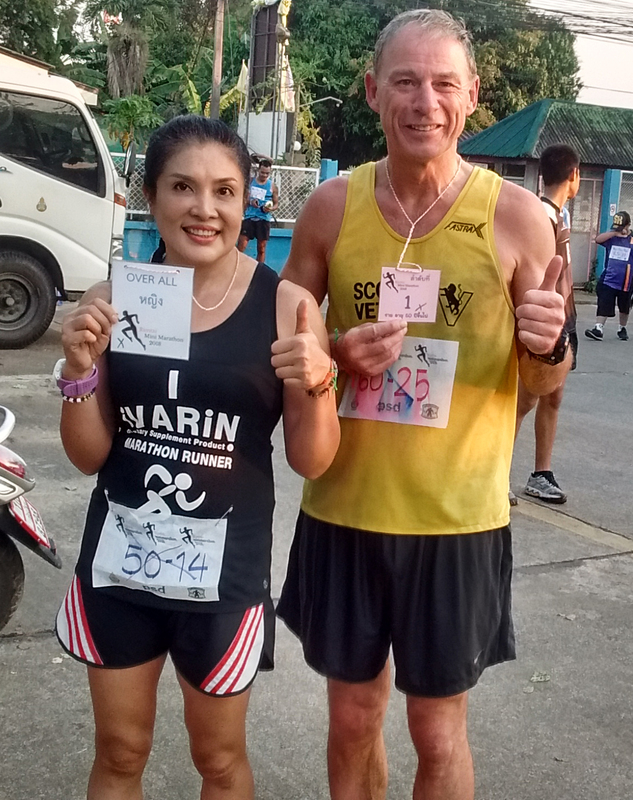 This meant that I had placed in the top five of my race and I was overjoyed when they handed me the necklace with No.1, meaning that I had won my first race in Chiang Mai, my first race in 2018 and my first ever Thailand 10k….ish. I was happy enough with my time of forty-five minutes for my first race of the year. 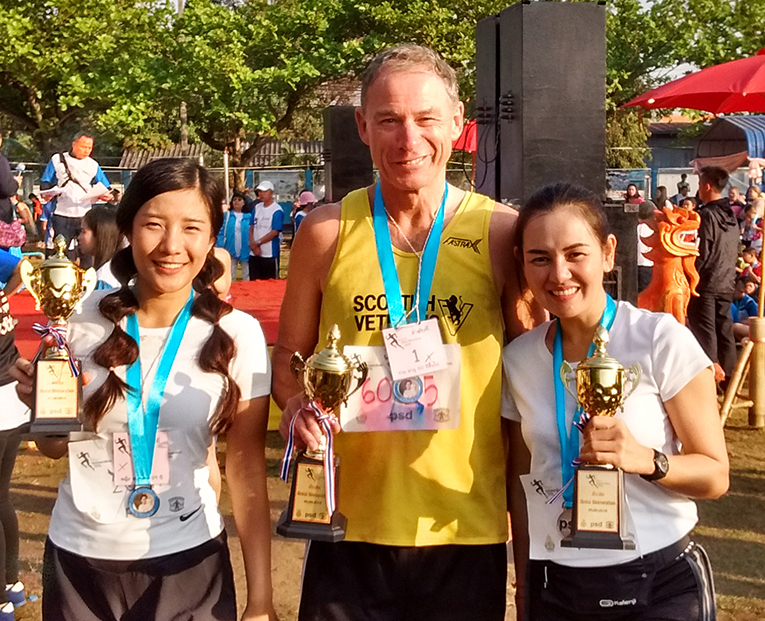 Once I’d got my breath back, I returned to the finish in time to congratulate Jit as she crossed the line to win the overall women’s race, followed by the ‘diminutive runner’ who placed ‘number two’ in the MV60 race. I mingled and chatted with the other runners as we collected our finisher’s medals and trophies and enjoyed some post-race Thai food whilst we waited for the award ceremony. It was good to catch up with some local running buddies and to make a few new ones too before awarded another massive trophy. I managed to get home with the trophies in my kit bag strapped to my back where they joined the others that I’ve won in my short time in the Land of Smiles. 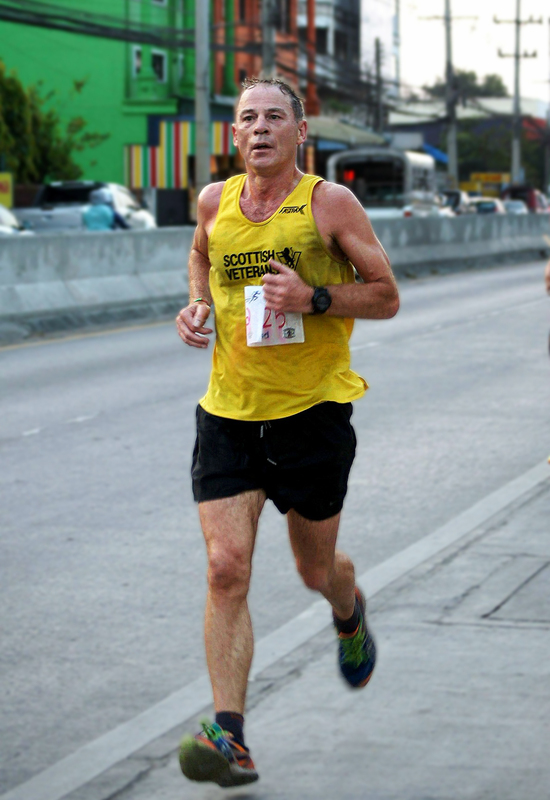 Being 60 isn’t too bad for an Ayrshire man in Asia. Many thanks to all concerned in organising and participating in the event and of course the photographers for helping to capture my memories of the race but what can I do with all these trophies?